But, i see the type of whorl i explained in my earlier post is not present in the FBI's models. is it only 4 type? or still there are many? I present the whorl finger print which is classed by Nadi astrologist as ' double circuit whorl finger print' ("Iru suttru vatta rekai" -In tamil language) from the following link. Hope, you can make out that this variety of whorl was not been categorized in your FBI's model. . .
My thumb finger is also comes under double circuit whorl finger print. .
Hi Stalin, your example can be described as a spiral-like variant of the 'plain whorl' because a spiral is described in the FBI system as a variant of a complete circuit. NOTICE: a complete circuit, may be spiral, oval, circular, or any variant of a circle. Beyond the FBI system, there are other fingerprint type classification models which describe more whorl-variants, however.in those systems the variants are not defined by detail (usually only with visual illustrations). I really see a grand generalized view of western palmistry here. Although there are so many varieties of whorl finger print could be seen, the western palmists seems to give same reading for all type of whorl finger prints. This make no sense to me. If there are many variants present, the interpretation should vary and denote the individual specificity of each. Another thing is that- i could not agree with you if you say it is the variant of plain whorl. . Some whorl finger print shows complete circular lines.. but The number of spiral whorls circuit also is not been considered in this generalization. However, i would appreciate it if you can give the link which deals plain spiral variants.. 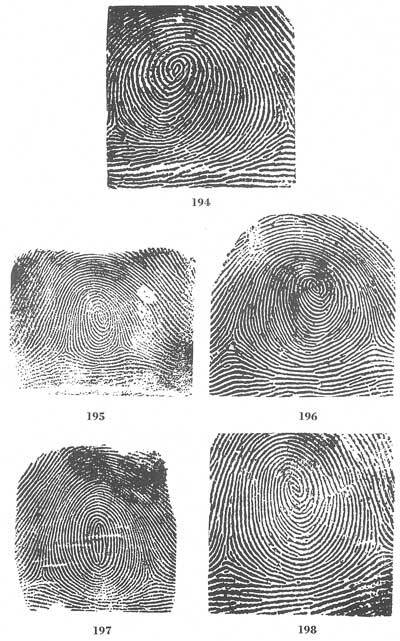 The fundamental problem with fingerprints is ... that every single fingerprint has it's unique characteristics. And therefore one has to draw somewhere a line in order to speak of 'variants'. Basically, I think it only makes sense to work with 'variants' which have proven to have at least some fundamental value. The fundamental significance of the FBI-variants have been confirmed in many perspectives (sexe, ethnicity, diseases, syndromes & psychology). So, the FBI system does makes sense... but your words clearly indicate that you are not able to recognize the value of the FBI approach. "... Some whorl finger print shows complete circular lines.. but The number of spiral whorls circuit also is not been considered in this generalization." ... suggest that you probably did not even read (carefully) the words that are featured in the picture that I presented in my first response: because the words in the picture clearly describe that a 'spiral-', 'oval-', and 'circle'-variant fall under the classification 'plain whorl'!! for hand reading and generalize the millions of peoples with in the 4 category of finger prints. How does it make sense to the ordinary intellectal peoples atleast? I need to tell you that today i went to get my reading -3 chapter- from the Nadi astrologist as i got the appointment. I asked them, that totally how many types of finger prints is been classed in their system at the end of the session. The Nadi astrologer said '108'. But i really wonder even modern medical profession struggle to frame the finger prints and generalized the variants into four. I found the specific information given by this Nadi astrologers are being far accurate than the western's generalized categories on finger prints. Basically, what your astrologer told you is that from his point of view he thinks your example is a 'double loop'... because his words 'double circuit whorl fingerprint', sounds quite a like a 'double loop' to me. However, assuming that you did show your astrologer a likewise example as presented in your picture, the details in that fingerprint show me that... formally, one can not speak of a 'double loop' at all - and the FBI system explains by detail why! Then, I also notice that you asked your astrologer for the number of fingerprint types: his answer was 108; but then your started comparing that number with the 4 whorl types that I have described... this shows again how you make essential mistakes in your considerations, because the FBI system actually described 8 major fingerprint types, including 4 whorl types. Because we are discussing the whorls only.... !! And you know what Stalin, I know how these people think... he probably would not even have been able to answer this question! What are the major fingerprint groups among those 108 fingerprint types? And how many whorls are included? And finally, let him explain his arguments for describing your fingerprint example as a ''double circuit whorl fingerprint''...? Because formally, you can tell him that the details show that there are no 2 'circuits' in that fingerprint at all!! Nearly every 'spiral whorl' has likewise characteristics where 1, 2 or more ridge lines end in the center of the fingeprint. Stalin, why did you first ask a question about how western researchers perceive the fingerprint types... in order to then suddenly 'change' your focuss on the comments of your astrologer - who probably hardly knows anything about the Wester forensic perspective! And therefore your astrologer's comments ... are quite irrelevant for the question that you present in your first post! PS. Stain, be aware, I am not trying to insult your astrologer's knowledge.... but we are discussing here a topic where your astrologer's view is quite irrelevant! Because it appears that he probably does not know anything about how whorls are perceived in the 'forensic perspective'... which was clearly the focuss or your question in your first post of this topic! If you want to compare the system of your astrologer with the FBI system... please create a new topic, and please try to avoid going 'off-topic'! 1. The real translation of the variety of finger print which i explained would be ' double circuit circle rekha'. This i explained in another topic as well. Double circuit represent in this particular finger print as well. Notice that i never said 'double loop' but i am sure that i dont have double loop infact. 2. FBI'S MODEL BROADLY CLASSIFIES THE FINGER PRINTS INTO 4 IF I AM RIGHT. -whorl, loop, arch and compositae - i think The 4 variety which you explained above plus, tented arch, arch, radial loop , ulnar loop. compositae- includes double loop spirals in some classification. 3. Yes, This topic of discussion is 'different type of whorls'. but through the FBI's model we miss and generalize many different varieties of finger prints. This becomes an opportunity to notice this issue. No stalin, your first (red) words above are not correct... and I wonder: when do you finally start reading the FBI book carefully? Instead of making assumptions about that book. Though, I have no problem with your second & third (green) sentences. "So, I really would like to know , what are the other varieties of whorl is been identified commonly so far. If any forensic science professionals or western dermatoglyphic researchers explain the specific details about the different varieties of whorl finger prints and total number of such variety, it would be great to know." Finally... by the way, quite a few researchers have presented fingeprint type models which many more type variants - for example: Cummins & Midlo presented a 'family-three' of 39 fingerprints variants (quoted from Mairs, 1933 or 1938). But I also think that for research purposes is this 'family three' far less suitable than the FBI model: because the 'need' for using so many variants has never ever been proven by anyone! Only non-researchers have started using dozens of fingerprint type variants... but nobody has ever presented a study by using so many variants. Because it doesn't make sense to me at all that you first refer in your question to the forensic/scientific perspective... in order to change the topic by the disqualifying the FBI model with the superficial incorrect personal assumptions that you have made about the FBI book... and I would not be surprized if you made likewise incorrect assumptions about your Nadi astrologer's model. Because, what do you really know about your Nadi astrologer's model...??? First of all, in finger prints there are no scientific and unscientic studies. because, it is naturally formed in the human's finger. FBI are not ultimate in this classification. Infact, even they have their own secrets which cannot be published to the society. and ... I have to dedicate atleast 5 years with the Nadi astrologers , as a assistand and have to serve them. Then only they can specifically teach the secrets of indian finger print methods. I do not prefer it as i have to do my medical profession well. However, It is good to see the various models of whorl finger print model from the different systems.